Welcome to God of Wonders, an epic 5-day Vacation Bible School adventure where your kids will explore the exciting story of Moses and discover the God of Wonders along the way! This all-in-one VBS is presented in 3 easy steps. Combine these simple steps with our out-of-this-world resources and let the wonder begin! The God of Wonders VBS is gospel-centered, kid-focused, and volunteer friendly. Included FREE with Sharefaith Kids Yearly and Sharefaith Complete, you can start your VBS and re-energize your Sunday school today, all for one unbeatable price. To pull off the perfect VBS, you'll need to recruit, promote & deliver. No need to stress, we've got you covered! Every great Vacation Bible School is founded on a strong team of volunteers. Recruit & equip your team with our announcement slides, handy bulletin inserts, & VBS checklist. A successful VBS means getting the word out. Promote your Vacation Bible School with beautifully designed posters, registration forms, and social media graphics. Present an inspiring VBS with 5 full days of kids Bible videos, curriculum, printable VBS activities and more! The moment you sign up, no need to wait, start downloading and let your VBS begin! God of Wonders is a half-day (4 hour) Vacation Bible School event. Everything you'll need has been neatly organized into 3 ready to download, content-rich resource bundles. PROMO PACK: Kingdom Kids provides everything you'll need to implement and promote VBS week with your church family. VBS Handbook: An easy to follow VBS guide. Announcements: Featuring bold graphics & beautiful design. Social Media Graphics: Share on Facebook, Pinterest & Twitter. SWAG PACK: This collection is pre-designed & ready to print! Get ready to create a big buzz around your VBS! Promo Posters: Wall art that gets VBS on people's calendars. Banners: Make your room stand out with big, bold designs. Stickers & Cards: Fun take-home VBS reminders. LESSON PACKS: Five daily bundles that include a complete VBS program with curriculum, videos, activities and more! PDF Files: VBS Curriculum, Skits, Small Groups and VBS Activities. Kids Bible Videos: Quizzes, lesson videos & countdowns. Slideshows: Teachings for both large and small groups. For less than $1/day, you can have it all! 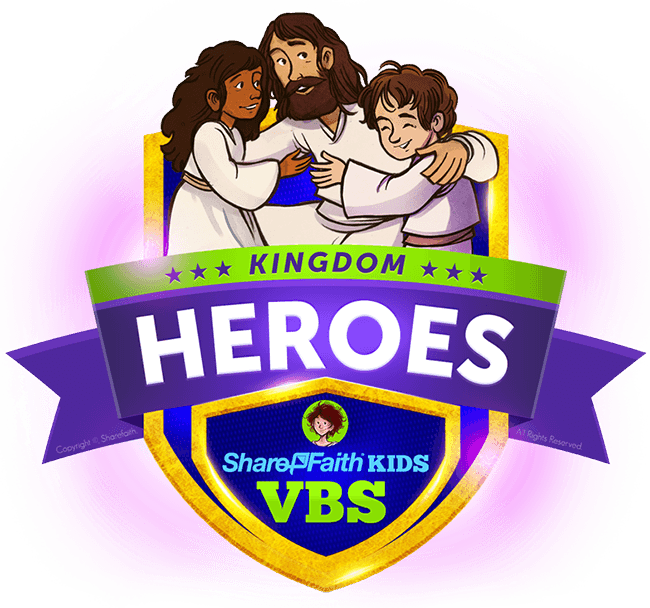 Sharefaith Kids combines VBS, Sunday School Lessons and Sunday School activities to bring teachers the most amazing, intuitive, and complete teaching resource on the planet! With stunning kids Bible videos and Sunday School activities, these Gospel-centered lessons come to life like never before. Sharefaith Kids is volunteer-friendly, kid-focused, Gospel-centered and extremely easy to prepare and teach. We even have a top-notch teacher scheduler and planner available on our Complete plan that takes Sunday School and VBS planning to an entirely new level. EXPLORE THIS EPIC 5-DAY VBS NOW!